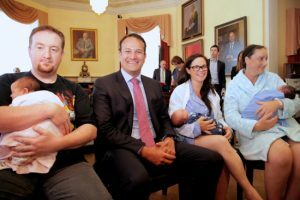 A national awareness campaign urging prospective parents to register for Paternity Benefit and explaining how to apply has been launched today (Tuesday, 2nd August 2016) by Minister for Social Protection Leo Varadkar. The campaign kicks off on social media this week including video and digital advertisements, in advance of Paternity Benefit becoming available on September 1st. Paternity Benefit will be paid at a rate of €230 a week for two weeks, to both employees and the self-employed. The awareness campaign informs prospective parents that they require a Public Service Card in order to apply for Paternity Benefit. And if they are an employee, they need to give four weeks’ notice to their employer to qualify for the accompanying Paternity Leave. Speaking at the campaign launch, Minister Varadkar said: “We want to make sure that fathers- and mothers-to-be across Ireland know that they can start claiming for two weeks of paternity benefit from September 1st. “That’s why my Department is launching a publicity campaign this week, to make sure that eligible parents apply for this ground-breaking measure, which provides a guaranteed income of €230 a week for two weeks. “We also want to ensure that fathers know how to apply. It’s really simple, but you need to take a few straightforward steps. You’re eligible for Paternity Benefit when you take your statutory two weeks of Paternity Leave and fulfil the PRSI requirements. You can take Paternity Leave at any time within the first 26 weeks of the child’s life, or following adoption.